This salad is definitely a recipe both Jen and I have had pinned on our food boards for a while, and I finally committed to it to try it. I saw a few versions of the salad and the one I was inspired by most was from the Diva Dish. I loved the interplay of the colors in the salad — bursting red cherry tomatoes, bright green creamy avocado, and the sunshine yellow of chickpeas and quinoa. She made her salad with lemon juice as the base for the dressing, but I actually think lime goes better with cilantro and avocado, so that’s where I took my creative license. My friend Tori and I made this alongside of a Mango Arugula and Avocado Salad and Peach, Tomato and Mozzarella Crostini. 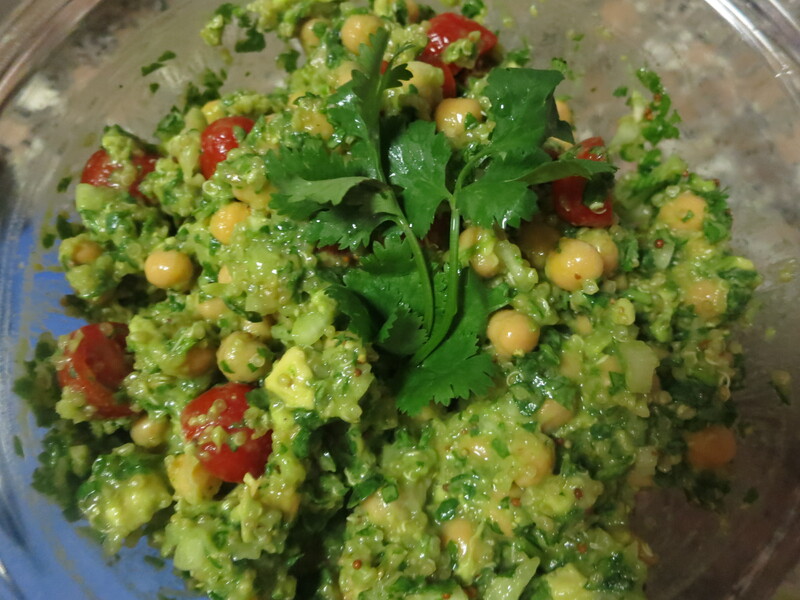 For another quinoa recipe idea, check out Quinoa Salad Tabbouleh-Style. 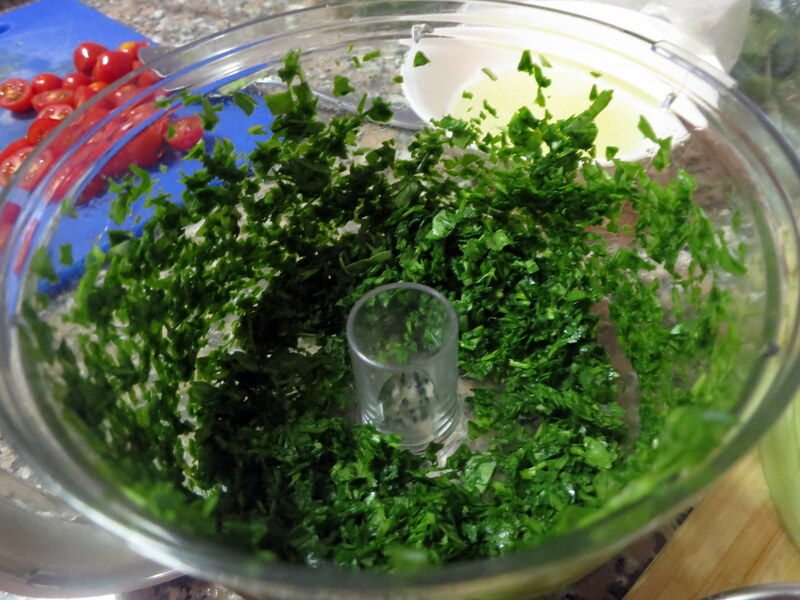 Either finely dice the spinach and cilantro or let it go in a food processor (which we did). Same for onions and garlic (those I decided to cut by hand to refine my knife skills). 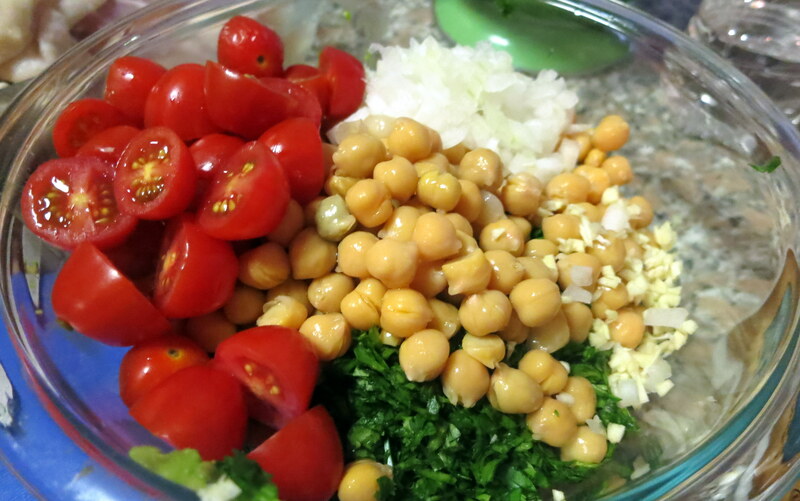 Add all to a bowl with the chickpeas. 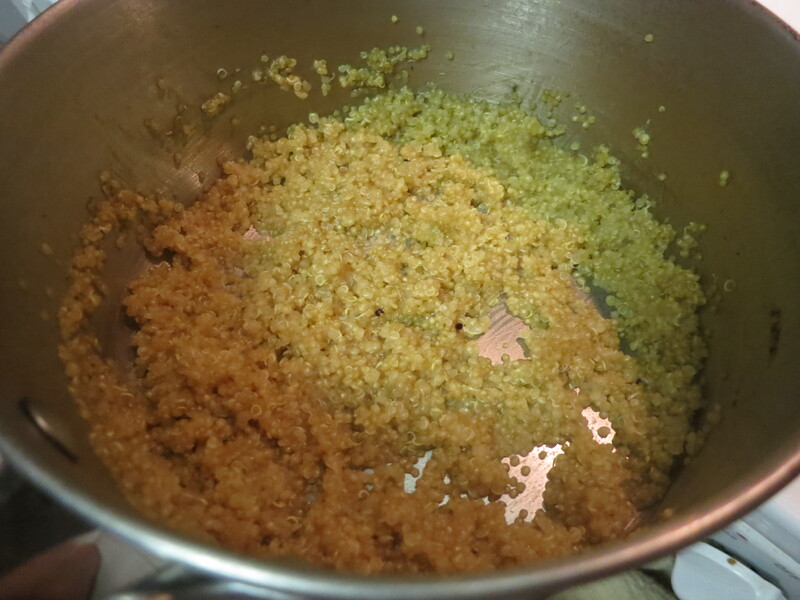 If the quinoa has cooled down, add as well. 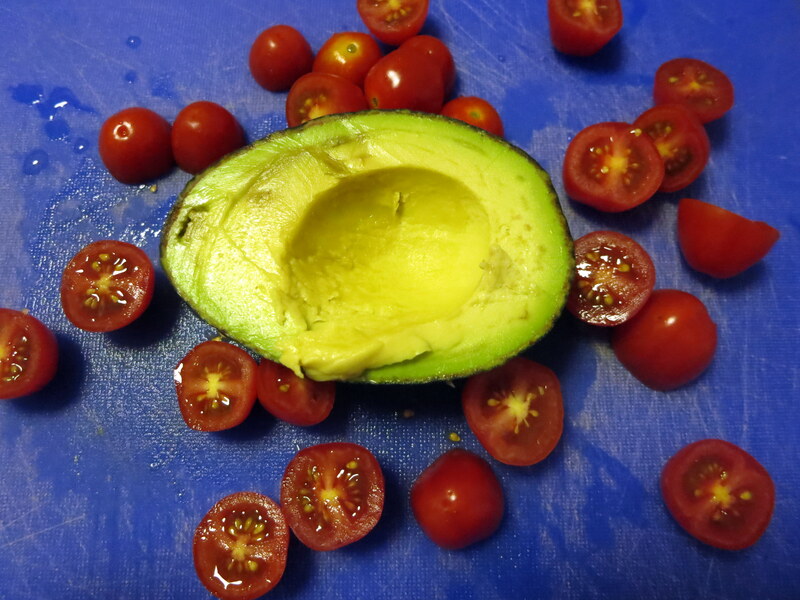 Add the tomatoes, avocado, and the dressing (just mix all the ingredients above together). Let cool in fridge for 10-15 minutes before serving. 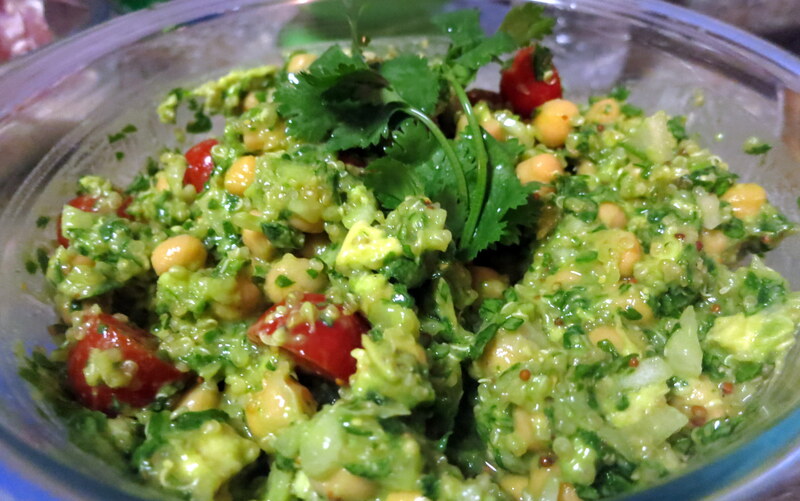 One note on the dressing: the amounts above are suggested, I tinkered with it until I got the sweetness/tanginess ratio that I desired, which for me entailed adding extra mustard and agave nectar to balance the strong acidity of the lime juice. Enjoy! This sounds delicious! I love the flavors of lime and cilantro!